Budget cuts are coming to the Flagler County school district—deep, broad cuts that will affect almost all faculty, staff and students in one way or another, including the elimination of 40 teaching positions in middle and high schools over the next two years and the reduction of the school day in middle and high school from seven periods to six. The shorter day will also apply in elementary school. Teachers’ planning schedules will change (currently every teacher gets one planning period during the school day). Employees who work longer than the 180-workday schedule of teachers will see their days reduced five or six days, depending on their position. That includes some service workers. And every one of the district’s para-professionals will see their work days reduced by four. Most of the 40 teaching positions would likely be eliminated in the coming school year, although like several other proposals, the school board would have to negotiate the cuts with the teachers and service employees unions. It could not enact them unilaterally. And principals will attempt to minimize actual job losses by leaving vacant positions unfilled and spreading some of the cuts over two years, so the actual number of teachers losing jobs would be smaller. 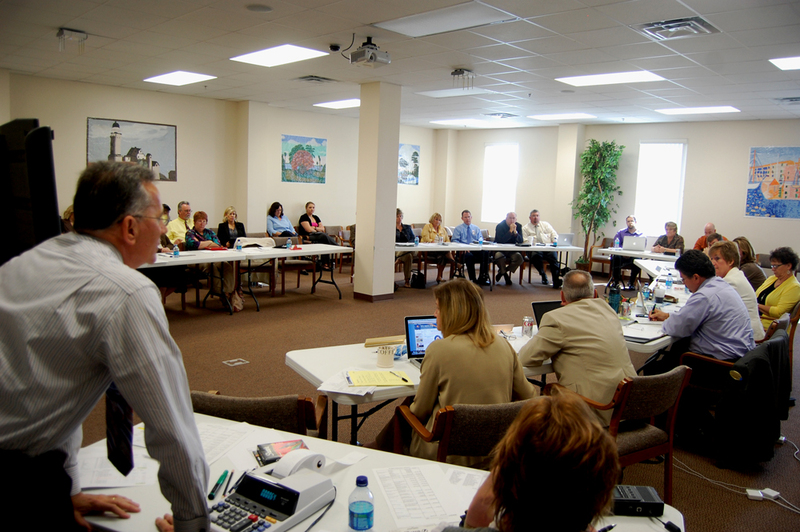 The Flagler County School Board held a four-hour workshop on budget cuts this morning, extended through lunch, with the district’s top administrators, including all but one school principal. Led by Board Chairwoman Sue Dickinson and Superintendent Janet Valentine. 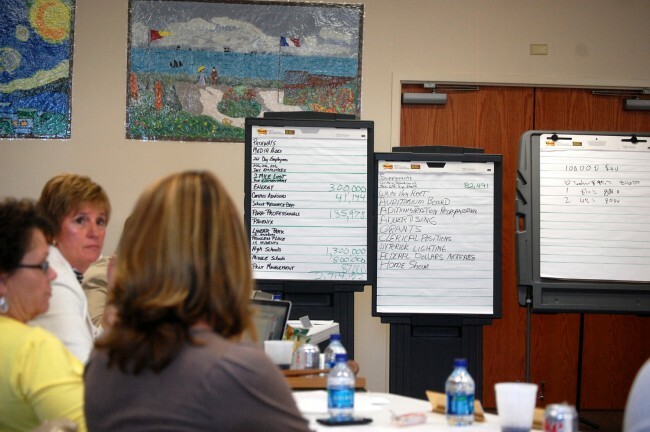 The board approached matters systematically, with a list of 17 budget-cut proposals totaling an annual saving of $4.7 million in a $100 million general-fund budget. That was the savings goal the board was trying to reach. Four hours later, it had agreed to cuts totaling $3.6 million—a figure it could live with, but only by dipping into reserves by about $1 million a year. That’s assuming that Gov. Rick Scott’s proposed cuts to school funding go through, and the district’s school population remains as static as it is this year. The cuts are necessary because the nearly $5 million in federal stimulus funding, which staved off cuts in the current and previous years, are running out, with no replacement in sight and no pick-up in the local or state economy to project better property tax revenues. Scott’s cuts would be compounding the loss of federal funding. None of the board’s decisions were formal: the board didn’t vote, and couldn’t vote, this being a workshop, and there’s still plenty of negotiating ahead. But Valentine wanted clear direction from the board on her recommendations—which were to be pursued, and which weren’t. She got both. One of the proposals that got no support is also the only proposal that would have affected thousands of families beyond schoolhouse doors (other than the shorter school day, which will affect all parents with children in public schools): imposing a 2-mile limit within which students would not be able to get bus transportation to and from school. Conklin was adamantly opposed, and signaled that even in the future, should would oppose such an imposition if it were to affect elementary age students. Other programs that were spared elimination: Phoenix Academy, campus police (that is, “school resource deputies”: the proposal to eliminate middle school deputies was scrapped), the service learning programs for 38 students at Linear Park and Princess Place Preserve. Pathways, the district’s alternative school, was one of the programs that could have been cut. The budget there will be cut, for a saving of $250,000, but the school itself will remain. By far the largest saving would be generated by eliminating the 40 teachers and reconfiguring the teacher-planning period. (Valentine is referring to it as “common planning,” which would be considered for either before or after [the] school day.) That would generate $2.5 million in savings. The reduction by six days in the work schedule of year-long employees—including administrators and the superintendent—would save $350,000. Valentine’s salary would, in fact, be cut. The reduction of other employees’ schedules would save an additional $162,000, while para-professionals’ schedule reductions to a 186-day schedule and a 6.5-hour per day schedule would save an additional $186,000. The district also projects energy savings of $300,000 by holding all summer programs at Buddy Taylor Middle School and Wadsworth Elementary, and closing all school buildings for two weeks during the year (the week of July 4 and the last week in December). The middle school campus advisor position would also be eliminated, for a saving of $41,000. Toward the end of the meeting, school board members proposed some of their own ideas either to generate savings or revenue. Trevor Tucker proposed indexing all salaries to the district’s revenue stream, based on percentages. In a year when revenue falls by a set percentage, then salaries would follow accordingly. In a year when revenue would increase by a set percentage, then salaries would rise accordingly. Heads nodded, though it wasn’t clear whether in agreement or disbelief. The same reaction greeted Conklin’s proposal, which, knowing how far out it was—especially for Conklin, who’s not been known to propose ideas generated by conservative think tanks—she prefaced with a series of qualifiers. The idea: eliminate health benefits as a district-based package, and let employees shop for their own on the open market, where they may find better rates. Those were just ideas, not recommendations or proposals the board agreed to, as in the other series of hard-dollar cuts. I am sad because this is what my daughter is going to school for. Teachers should be rewarded a lot more for all the wonderful things they do. It is sad that professional athletes and stars get paid millions but teachers, police officers, firefighters etc. aren’t shown how much they are appreciated! This is a sad situation…so much for no child left behind…makes me want to rethink the degree in teaching that i am working to get. This is why my child will be in private school as long as we live here, which is sad considering we also pay taxes in addition to tuition. I’m sure a lot of families will be leaving Florida if they are financially able. This is ridiculous. The first item on the agenda that is attacked when the money is tight is education. Why educate the public when we can keep them stupid? Why move forward in science, math, language, when we can focus the decimation of women’s rights and close-minded attacks on people that are different? I keep saying it but we are witnessing the decline of America and it has nothing to do with Obama. We have been on this path for decades, since the start of “Reaganomics” which elevated the rich and allowed class warfare to gain a strong foothold in society. Videos on youtube show people of all ages being asked simple questions, was Andrew Jackson president, what is the capital of Michigan, where is Iraq on a map and people have no clue (real or facetious for a laugh). It is a sad state of affairs that we have going on in this country and it does not matter who is in charge, it was a predestined course of action. If they shorten the HS and Middle school day by 1 period/class, how will students be able to fulfill the graduation/promotion requirements? Don’t they need to have a certain number of credits every year? In December 2010 the school district gave out raises that require $2.4 million per year of additional spending. I guess there was no plan in place to pay for the raises. This is completely predictable. The taxes that we pay where do they go? The most important thing now is educating the students now more than ever. They watch all that nonsense on television, they end up drinking, doing drugs, being disrespectful, getting pregnant. All of those statistics will rise because they will have free time on their hands by cutting days. Are you serious? The level of teaching is horrible. It’s so low it’s completely laughable. Where does all the money go? Building more tennis courts and golf courses? Or maybe tearing up flower beds, sprinkler systems in the medians of the road every year because one tiny thing is messed up. This is a kids future here. Cutting budgets will not help. Hike up taxes, get rid of the no child left behind act, and push education. Not everyone in Flagler County (Flagler Beach) has children in public schools here yet schools still take the largest portion of our real estate taxes. Also, what ever happened to the lottery support? Wow flagler1, how selfish are you? You sound like your retired or don’t have children. If you have children someone’s taxes paid for them, probably back up in NJ. When the stat started the lottery they cut the school budgets back then. Also, as part of being in a community you need to pay for things in that community such as schools, police and firefighters. So by on that note should we just send a bill to anyone that needs police or firefighters, and if they can’t pay then too bad for them. With out education crime will continue to rise and more people will be unemployed and on welfare so you can’y have it both ways. So if you don’t like paying taxes for services offered by the state and county then get the hell out. For all of the right wing tea partiets that want to cut education spending at the state and national level you need to look else where. Did anybody know that the US Army spends over $7 million dollars a year on it’s sponsorship of NASCAR. That amount of money would be better served being spent on education than driving around in circles in front of a bunch of drunk and ignorant rednecks. That amount of money would help Flagler county, so we need to look at exactly what our money is being spent on not cutting programs we think are worthless or not aligned with our ideologies. HUH, I’m not sure about middle school, but at the high school students are required to have 24 credits to graduate. 6 periods a year for 4 years equals just that. There will not be room for one failing grade or extra electives. Using something other than the $80 a pack “Post-it” template paper they are using would be a good start!!! This is just extremely sad. And we wonder why we have one of the highest unemployment rates in the country. We should be budgeting MORE money into our children’s education, not taking away from it. I truly feel sorry for the Teachers and the Students. This is just shameful. Florida has become a disgrace and an embarrassment to public education. Be sure to thank the so-called governor who made this possible. He wants to take away from your children. “Let’s get to Work.” Nice campaign slogan. Maybe he should take his own advice. Gee…I wonder how much he spent on his own inauguration party? More than $2,000,000. More than twice the amount Crist spent. I wonder if that could have gone to better causes…other than his own self-indulgence and ego? And he has the audacity to discuss financial cutbacks??????? Keep those blindfolds on, tea-baggers. I understand that Rick Scott won only for a small margin of 52% supported by the medical industry of Florida and the big businesses. Now teachers and students among other will endure his special interest lobbying. He needs to raise the billions needed like I said before, from the cruise lines and oil corporations that thanks to the gouging at the pump are posting the largest earnings ever in history and all the wealthy like Warren Buffet as himself complained about this un justice, other than being taxed at 39% plus as we all pay, their rate is from zero to 17%. No cuts in education needed if our tax rate will be equalized for all. Also where goes our Florida lottery revenue as was supposed to be for schools? And honestly, what disgusts me most is how much money these politicians raise to run for office. I mean, really, if there was only a set amount of money to spend, all those millions and sometimes billions of dollars could be put to much better use: Into education, back into the economy, etc. Take 25% of salary pool and award as merit pay. The remaining 75% is base pay. Teachers who produce substandard students get no merit pay. Police officers with a crime rate increase in their sector get no merit pay. Firefighters in a station house in an area where too many fires occur get no merit pay. This seems fair to an extent. But where do we start? For eg, how can we expect a 5th grade teacher to improve a student who has been passed up grade after grade after grade without learning what was taught because the previous teachers did not do their job. Then the blame would pass to each of the child’s previous teachers, because each teacher would blame the previous teacher, ultimately ending with the kindergarten teacher, the child’s first teacher, and this is not entirely true nor fair. If kids don’t get it they are just too dumb. If the kids are poor, they are not going to amount to much, so no point in educating them. I only want to work 185 day, no more and I want my summers off, etc, etc. That’s why I’m getting into teaching. Fine, exemplary teachers we are churning out. But where did it all start? I know that I will finish the program, but I don’t know if I can become a teacher. I annoy a lot of people for speaking up, but I don’t want to have to shut up. its not their fault it a bad teacher, not bad administration, the administrator is the one that hired the “bad” teacher. Are administrators giving teachers the resources they need to succeed? No, they are not, it’s just sink or swim.